In the early twentieth century the area now know as Wilton Manors was known as Colohatchee. A train stop along the Florida East Coast Railroad near the current NE 24th Street shared that name. The name Wilton Manors was coined in 1925 by Ned Willingham, a Georgia transplant and land developer. 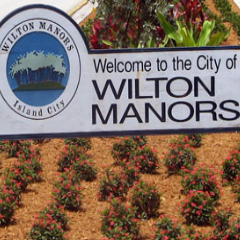 Wilton Manors was incorporated in 1947. The city is home to a sizable LGBT minority as well as winter vacationers, who frequent its many nightclubs and gay-owned businesses along the main street, Wilton Drive. Wilton Drive is the equivalent of “Main Street” in Wilton Manors. Over the past twenty years, the Wilton Drive corridor has undergone an economic transformation. Formerly a sleepy street lined with small retail shops, Wilton Drive is now the small City’s Arts & Entertainment District, home to numerous restaurants, bars, shops, condos and rental developments that have blossomed over the last decade. Many of the businesses in the Arts & Entertainment District are LGBT-owned and/or operated, and “The Drive” has become a local, regional, and national destination for LGBT tourism.